The cactus family is one of the most easily recognized plant families in the world. Their beautiful blossoms, thick stems and unusual shapes attract thousands of people to the desert each year. Cactus, as a plant family, show variations between the individual species. 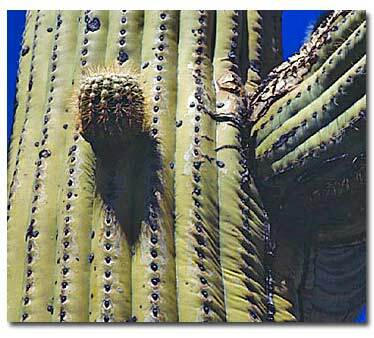 They range from the three-inch fishhook cactus nestled in a rock crevice to the towering saguaro cactus which reaches heights of 30 to 40 feet. Cactus grow on rocky hillsides, alluvial fans and in barren washes throughout the desert. Cactus is an American plant family not native to Europe, Africa or Australia. Very little is known about early cactus plants because only two cactus fossils have ever been found. The oldest, found in Utah, dates to 50 million years ago and was similar to today's prickly pear. Cactus plants probably grew in a tropical environment until about 65 million years ago when, in much of California, the climate changed from year-round rainfall to a pattern of dry summers and wet winters. Later, when the desert began to form as the Sierra Nevada and Peninsular Ranges rose and blocked rainfall to the eastern valleys, the cactus adapted to the dry, desert conditions. Although cactus are synonymous with desert regions, they are found in some unlikely places. In the lush, tropical regions of Mexico, South America and some Caribbean Islands, tall columnar cactus grow among hanging vines and large-leaved trees. One species grows at an elevation of 11,000 feet in the Sierra Nevadas. Cactus owe their success in the desert to their structural adaptations. While other desert plants may have similar features such as spines and succulent stems, these evolutionary traits reach a zenith in the cactus. Cactus take advantage of the lightest rainfall by having roots close to the soil surface. The water is quickly collected by the roots and stored in thick, expandable stems for the long summer drought. The fleshy stems of the barrel cactus are pleated like an accordion and shrink as moisture is used up. These pleats also channel water to the base of the plant during rain showers. When water is no longer available in the summer, many desert shrubs drop their leaves and become dormant. Cactus continue to photosynthesize because they have fixed spines instead of leaves. The green stems produce the plant's food, but lose less water than leaves because of their sunken pores and a waxy coating on the surface of the stem. The pores close during the head of the day and open at night to release a small amount of moisture. The dense network of spines shades the stems, keeping them cooler than the surrounding air. Many barrel cactus lean to the south so that a minimum of body surface is exposed to the drying effect of the midday sun. Cactus pay a price for these water-saving adaptations -- slow growth. Growth may be as little as 1/4 inch per year in the barrel cactus, and most young sprouts never reach maturity. For many animals such as the bighorn sheep and the antelope ground squirrel, cactus are an important source of food and water. The cactus wren and California thrasher often build their nests in the buckhorn cholla. These birds trim spines from the cactus to permit their own easier access, but rely on the balance of the spines for protection from foxes, coyotes and predatory birds. The Gila woodpeckers and gilded flickers, chop burrows in the long arms of the saguaro cactus. Owls, flycatchers, and starlings also use the abandoned homes in the saguaros as their abodes. Different varieties of cactus was used for food and medicinal purposes by Native Americans for thousands of years. The Cahuilla Indians spent the cooler months gathering wanted plants. They harvested the fruit of the beavertail cactus for its sweetness. The fruit was cooked in a pit with hot stones for at least 12 hours, and the large seeds were ground into a mush. When the flesh pads were young, they were cut into small pieces, boiled and served as greens. Native women used gathering sticks to harvest the buds of barrel cactus to prevent being injured by the sharp spines. Usually these buds were parboiled several times to remove the bitter flavor before they were eaten. 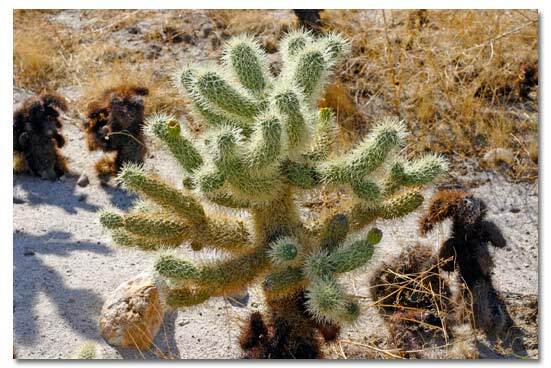 The buckhorn cholla was used medicinally by the Cahuilla. The stems were burned, and the ashes were applied to cuts and burns to aid in the healing process. Cactus are found throughout the desert regions and usually bloom in late March through May. The blossoms range in color from the deep magenta of the hedgehog cactus to the cream-colored blossoms of the saguaro, and from bright yellow prickly pear to the pink blooms of the beavertail cactus. Cactus, highly adapted to the harsh desert environment, flourish in places where other plants cannot survive. Their survival is threatened by "cactus rustlers" who steal these plants for the profitable landscaping trade. Some individuals destroy cactus by operating vehicles off the road while still others use these ancient plants for target practice. 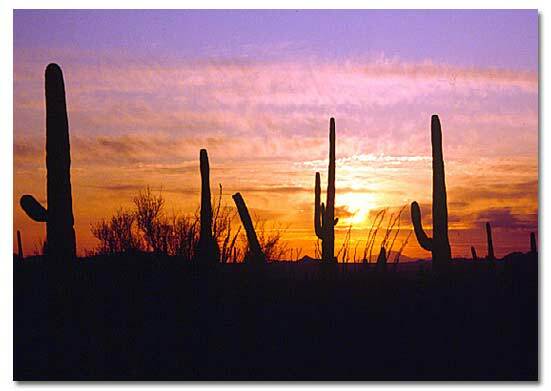 It is illegal to disturb or remove cactus on any public lands. By protecting the cactus you are helping preserve the desert's intricate and fragile web of life. 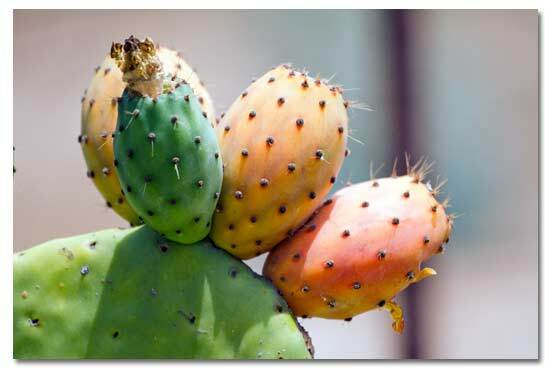 Prickly Pear Products - Taste the Fruits of the Desert! Everything from Prickly Pear syrup for deserts, drinks and coolers, to Cactus Candy, jelly and honey! Hangover Terminator too! The prickly pear plant (also called nopal or nopalitos in Spanish) and the prickly pear cactus fruit (also known as tuna in Spanish) is an edible nutritious and delicious food offering vitamins, minerals and medicinal properties. There has been medical interest in the Prickly Pear plant. Some studies have shown that the pectin contained in the Prickly Pear pulp lowers levels of "bad" cholesterol while leaving "good" cholesterol levels unchanged. Another study found that the fibrous pectin in the fruit may lower diabetics' need for insulin. Both fruits and pads of the prickly pear cactus are rich in slowly absorbed soluble fibers that help keep blood sugar stable.